With the days lengthening and weather warming, spring is a good time to get outdoors and tackle some larger home projects. With the threat of winter storms past, you can look for damage and make any needed repairs, as well as prep your home and garden for summer. We spoke with an expert to get some tips on what to watch for this season, from proper irrigation to mosquitoes and termites (oh my!). The best way to prevent mosquitos around your home is simply to get rid of any standing water. “Walk around your property [and peek at your neighbors’]. If you see anything or any area where water stands, fix it, tip it, get rid of it or maintain it regularly,” Sedinger says. Clean gutters and downspouts. After the last frost has passed, it’s important to have your gutters and downspouts cleaned and repaired. “Clogged gutters and downspouts can cause the wood trim at the eaves to rot, and that can invite all kinds of critters into your attic space,” Sedinger says. Zoocasa conducted the online survey of more than 1,300 Canadians from Sept. 27 to Oct. 3. So Now You Own a Home. Do You Know How to Maintain it? © Heather Walsh for The New York Times Althea Sandiford took a seven-week home maintenance course to help her tackle projects around her Long Island home.Home maintenance classes can help you save money and be smarter about what needs to be done to keep your new home in shape. After the heady early days of homeownership wear off, first-time buyers often quickly realize that they lack even the most basic skills needed to take care of their new home. For New Yorkers accustomed to calling the super for every repair, using a drill to hang drapes or an Allen wrench to fix a leaky faucet can be nearly as daunting as the idea of performing brain surgery. You can get all the inspiration you need from do-it-yourself shows and videos, but what if you don’t know how to properly hammer a nail and don’t even own the right tools? This is where home repair classes can help, giving uninitiated homeowners hands-on training. Courses cover a range of skills, from basic home maintenance to more elaborate tasks like tiling a bathroom, installing locks and repairing or replacing drywall. A skilled labor shortage that makes it increasingly difficult to find a reliable handyman is what drove Mary McCabe to take a series of home repair classes at the New York City College of Technology, at the City University of New York. Comfortable around tools, because her father had been a carpenter, Ms. McCabe has taken five classes this year and has used her newfound skills to re-grout her bathroom tiles and fix a lawn mower. “Most people are intimidated with using tools, but taking a hands-on class really boosted my confidence,” she said. She estimated that she has saved about $3,000 so far, just by learning how to do simple home repairs herself. Most of the home repair classes in the city are offered through housing-related nonprofit organizations and the continuing education divisions of community colleges, including Bronx Community College. The Home Depot also offers free classes in several Manhattan, New Jersey and Long Island locations. Just as learning how to save for and finance a home is important to financial literacy, educating yourself on how to maintain your home will not only give you a sense of mastery, but can also help you save money on repairs. And you’ll have a better sense of when you need to call a professional. © Tony Cenicola/The New York Times John Rearick has taken classes to learn basic carpentry skills, as well as how to use a circular saw and repair Sheetrock. The beginners’ repair classes at City Tech — which include Homeowner’s Basic Tool Kit and Everyday Electricity You Can Do Yourself — cost $70 for a one-time, three-hour night class at the school’s Downtown Brooklyn location. That is not a lot of money when you consider that it could save you hundreds of dollars a year, said Debra Salomon, a City Tech program director in the division of continuing education. A July 2018 HomeAdvisor survey found that, on average, homeowners spent $6,649 on home improvement projects per household over the previous 12 months. Understanding the need for extra financial reserves to pay for repairs should be part of the educational process of becoming a homeowner, said Yoselin Genao-Estrella, the executive director of the nonprofit organization Neighborhood Housing Services of Queens CDC, Inc. The Woodside-based community development corporation has classes on first-time home buying and financial literacy, offers foreclosure service and, for about 20 years, has offered an eight-week home maintenance course. The course costs $175 and is held on the second floor of a Sterling National Bank branch in Woodside. Ms. Genao-Estrella has taken the course herself. When her home in the Canarsie section of Brooklyn was damaged by Hurricane Sandy almost six years ago, she hired a contractor to fix the structural damage and a plumber for other repairs, but the plumbing problems kept reoccurring. “I’m not saying I need to become a plumber myself, but I felt I was getting the short end of the stick every time I was having a conversation, especially as a woman,” she said. Knowing how your house works is important, she added, because you can be more specific about repair requests when hiring someone. Althea Sandiford, who owns a single-family home in Brentwood, Long Island, said she was able to patch up some holes in her basement and clear a clogged drain in her shower after taking a seven-week home maintenance program at the nonprofit Community Development Corporation of Long Island. The class size was small — between three and six people, depending on the week — said Ms. Sandiford, an insurance auditor. Classes are held at the organization’s headquarters in Centereach, N.Y., and the fee depends on a family’s size and income, but is never more than $80. Ms. Sandiford’s instructors were licensed contractors who taught her how to repair and replace Sheetrock, how to lay tile and the basics of plumbing. Tricia Gleaton, vice president of the organization’s homeownership center, said many of the students who sign up for the class have never picked up a hammer, and students include both singles and couples, some of whom have bought fixer-uppers nearby. Cable channels like HGTV and DIY Network have turned home repair projects into entertainment, but the do-it-yourself industry is extensive in online platforms too. In addition to the content available on YouTube, websites like Hometalk and Terry Love Plumbing and Remodel DIY and Professional Forum and podcasts like Fix It Home Improvement and Fix It 101 have solid followings. But there is no point in watching and listening to all that content if you don’t know how to use a simple power drill, said Stephanie Lombardi Werneken, director of new digital products at Trusted Media Brands, publisher of the magazine Family Handyman. Trusted Media started the online Family Handyman DIY University in 2015, so people could take quick classes to learn things like how to buy and use a table saw, or how to drill into materials like wood or masonry. Each class can be completed in one to three hours, and the fee is less than $20. “These basic classes are there so you can be safe, and not burn down the house,” she said. Premium courses are being offered for the first time this year, for $89 to about $200. They last a few weeks, and students can ask their instructors specific questions online. The courses include kitchen cabinetry making and building your own tiny house, and some courses come with blueprints and other materials. About 70 percent of the nearly 4,000 students who have taken DIY University’s online classes have been male, and students range in age from 35 to 70, Ms. Werneken said. Some of the older students have taken the class to fix up their homes before selling them, she said, but the younger students seem to have embraced a “DIY holistic-homeownership lifestyle” to mirror that of the popular hosts of some DIY television shows. Raya Fliker, a homeowner in Port Monmouth, N.J., took a class on wood-finishing at DIY University, and also learned how to tile a kitchen backsplash. With her newfound knowledge, Ms. Fliker built a simple bench to fit into a small nook in her back entryway. She also built a plywood countertop to cover up a granite top on a kitchen island that she didn’t like. Ms. Fliker, a nurse and mother of three, preferred taking classes online, she said, because she could do it whenever she had time, and the instructors taught her specific tasks that she wanted to learn. “I have loved how every project has turned out, and my husband is now buying tools for me,” said Ms. Flicker, who recently refurbished a mudroom for a friend’s house. Not every project has gone smoothly, of course. Although she wanted to install a new kitchen backsplash, the granite border on her kitchen counter was extremely difficult to remove, she said. When she pried off a small portion near the refrigerator, Ms. Fliker ended up with a big hole. “It was too hard for me to handle, so I fixed the hole and painted over it,” she said, after watching a YouTube tutorial. Then she abandoned the backsplash project. John Rearick, a high school English teacher, took two home repair classes through Neighborhood Housing Services of Brooklyn, a community development corporation with locations in East Flatbush and Canarsie. Mr. Rearick said he took his first class almost 10 years ago after hearing about it from a friend. He learned basic carpentry skills, as well as how to use a circular saw, repair Sheetrock and build mock flooring. His instructor, Mark Whittingham, a licensed general contractor, owner of M.W. Enterprise and project manager at Thor Helical USA, a masonry restoration firm, taught him how to build things and then take them apart. “Understanding the mechanics of things helped a lot,” said Mr. Rearick, who lives in a single-family house in Kensington, Brooklyn. He has since patched up a large hole in his third-floor hallway, damage that happened years ago, after his son and a friend had an impromptu basketball game there. More recently, he replaced a leaking water valve in the basement, which cost him about five dollars. “I did wonder, if I hadn’t fixed that myself, would I have paid someone to do it for me for $200?” he said. Mr. Rearick repeated the same class this spring — a seven-week course currently held at the Flatbush YMCA, for $175 — as a refresher. “Besides saving money, there are emotional benefits of being able to fix things yourself,” he said. Both he and Ms. McCabe, in Queens, said they were eager to take more advanced classes. Ms. McCabe said she was interested in hanging a new chandelier in her dining room, installing other light fixtures and changing out some old doors. Mr. Grech, who also trains superintendents, makes a point of teaching his students when they should call a licensed professional. One example: You can fix leaky faucets and clogged drains yourself, he said, but you shouldn’t try to move pipes. A list of tools every homeowner should have for basic maintenance. 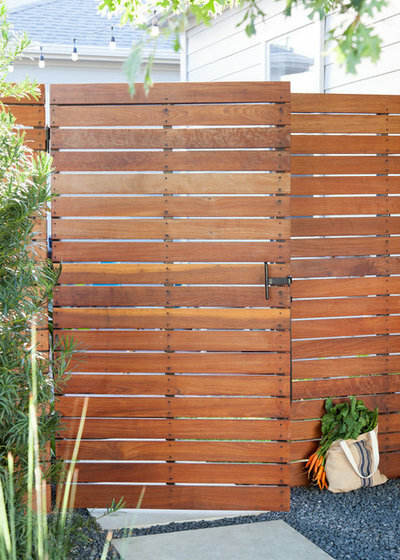 Reseal exterior woodwork.Wood decks, fences, railings, trellises, pergolas and other outdoor structures will last longer if they’re stained or resealed every year or two. 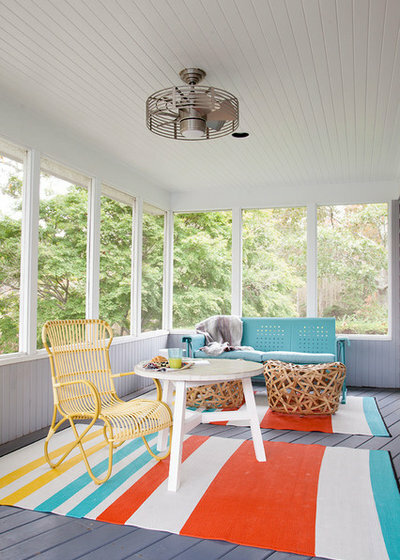 Tell us: Are you excited to get out there and tackle some home projects this spring or are you dreading it? Share which seasonal tasks you love — and which you could live without — in the Comments. When I bought my dream home two years ago, I wasn’t imagining myself standing in my basement, holding an umbrella, watching my husband chase streams of water with a flashlight. But that’s where I ended up. It was the first spring thaw and he was trying to figure out where the leaks were coming from. Clad in his work boots and a rain jacket he would alternate between stepping outside our basement door, where the rain came down in big sheets of cold wetness, and ducking into our basement to inspect various parts of our foundation. It would take three more rainstorms, the installation of a sump pump and a complete overhaul of our plumbing before we were able to correct the problem. That was a rough introduction to the world of home ownership, but I don’t regret buying the place. It’s a great century-old row house in downtown Toronto in an eclectic and vibrant west-end neighbourhood. Still, as I watched the balance on our line of credit creep up to the $40,000 mark, I started to wonder: How much does it cost to maintain a home anyway? After a bit of research, I found out that the general rule of thumb is that you should expect to spend 3% to 5% of the value of your home every year, on average. For a 40- year-old home worth $500,000 that means you’ll need to set aside up to $25,000 every year. I ran that figure by my husband, who is—as it happens—a commercial and residential general contractor, and he said that sounded high. But is it? We were savvier home buyers than many, but we still underestimated the cost of fixing our drainage issues and the expense of tearing down the garage (“Give it a year and you won’t have to,” one broker told us when were out shopping for insurance). So, to get a handle on the real cost of maintaining a home, I decided to price out all of the major maintenance and repairs you can expect to perform on a typical 2,000-square-foot detached house in Canada myself. To do this I looked at two different kinds of upkeep. 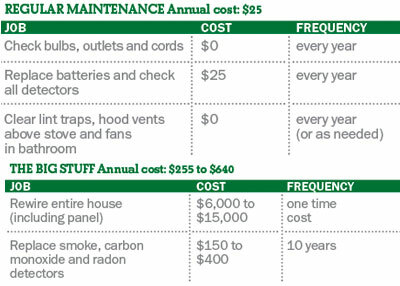 The first is the regular annual maintenance that every homeowner should do to keep his or her home running smoothly. Things like changing the furnace filters and patching the driveway. The second kind of upkeep includes those once-a-decade expenses that tend to result in migraines. Here I’m talking about things like replacing your hot water heater because it rusted through, or replacing all of your outdated electrical wiring. To get an accurate figure, I divided up the typical home into its seven major components and tallied up the costs for both large and small jobs over 25 years. I then annualized that amount, so you can make sure that you’re contributing enough to your household maintenance budget every year. I also include tips on regular maintenance you can do to keep those little problems from turning into expensive headaches. But I didn’t include jobs such as interior painting, or upgrading your kitchen cabinets. I focussed on the bare bones maintenance you need to do to protect your home and keep it from deteriorating. In short, if you’re wondering why your car came with a maintenance guide, but your home didn’t—problem solved. 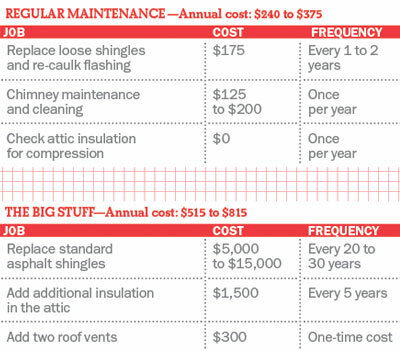 Because here it is: A complete maintenance guide for your home. When Steve Bedernjak bought his detached fixer-upper bungalow in one of Toronto’s up-and-coming neighbourhoods four years ago, he didn’t bother getting it inspected. Why bother? He already knew the place needed a lot of work, and he had a plan. He’d renovate one of the bathrooms and update the very outdated kitchen. He had $15,000 saved up for the job and a great deal of handyman know-how. 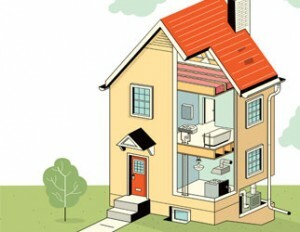 But his first winter brought with it a slew of plumbing problems that threw a soggy blanket on his renovation strategy. After a particularly cold spell, the pipes in the main floor bathroom froze. Swamped with work, Steve plugged a heater into the bathroom, turned on the bathtub faucet and left. Hours later he returned to the sound of running water—but the bathtub was dry. To his dismay, while the heater had helped thaw the frozen plumbing, the extreme temperature change had caused a rupture in the copper joints in the basement. “There was water everywhere.” Worse yet: Steve had to take a sledgehammer to the bathroom’s shower, since the previous homeowner had tiled over the main shut-off valve. A few simple steps can go a long way towards making sure the same thing doesn’t happen to you. Consider insulating all of your exposed pipes for starters—especially if they run through an unheated garage or unfinished basement. Uninsulated pipes are susceptible to temperature changes and start to sweat. This condensation starts to corrode the pipes, decreasing the life of your plumbing. Another good habit to develop is to test all the faucets regularly and swap out old washers when taps begin to drip. Once a year top up floor drains with water to prevent sewer gases from entering your home. (A properly installed drain should have a trap—a U-shaped pipe that holds water and prevents sewer gas, such as methane, from seeping into your home.) A trick is to pour a quarter cup of mineral oil down the drain. The mineral oil sits on the water barrier and slows down the rate of evaporation. Finally, it’s always a good idea to make sure you know where the main shut off valve for your home is located. Test it every year to make sure it’s working—and that you can get at it if you need to. 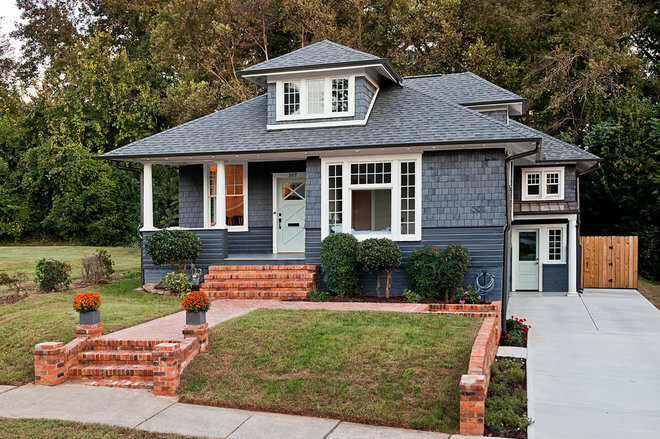 While curb appeal is important, remember that the primary job of your home’s exterior is to protect your home. 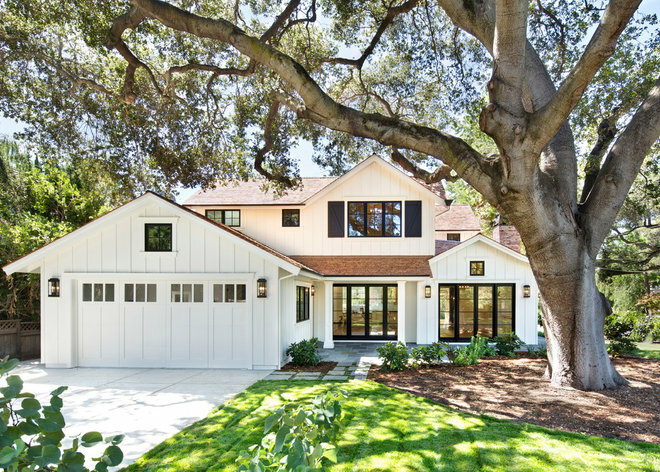 Not easy given fluctuating temperatures, changing seasons, and the various protrusions, sharp angles and different materials used in home construction. Your job is to keep that exterior as seamless as possible—a task even Canada’s worst handyman can accomplish. Every year start by power washing your property. (Don’t do this if you have a brick home as the force of the spray can damage the brick. Instead, consider getting the brick professionally cleaned every few decades.) 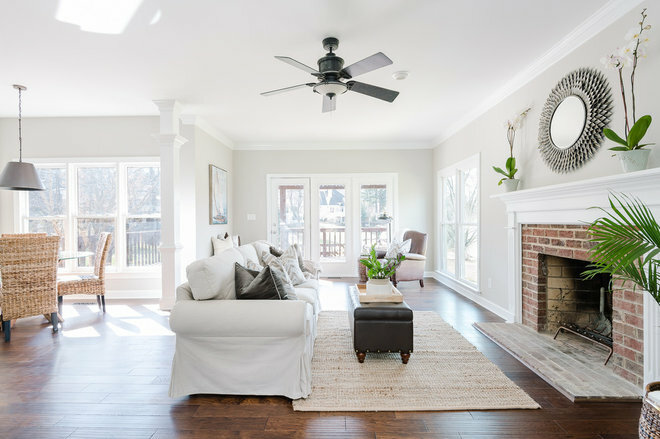 By cleaning off the dirt and grime—and taking the time to just stare at your home—you’ll get a pretty good idea of necessary repairs and replacements. For instance if you notice the outside tap (known as a bib) froze during the winter, replace it with an antifreeze model—this $30 do-it-yourself fix could save you thousands in the long run. Consider replacing the weather stripping around windows and doors, as well as the door sweep, that rubber thingie at the bottom of the door that creates an airtight seal. Simple and cheap, these maintenance steps will help increase the energy efficiency in your home and will also prolong the life of the exterior shell. Many of these jobs can be completed in a few hours or in a weekend, and they don’t require the skills of a professional. When all the routine maintenance is complete, turn your attention to strategic updates. 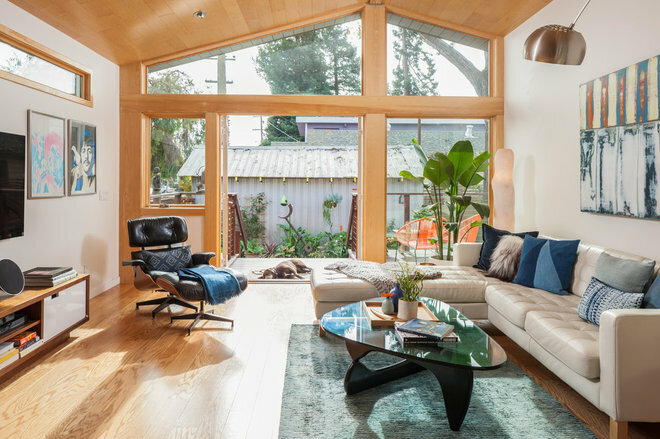 Replacing old wooden windows with vinyl models will cost between $3,000 and $12,000, but it will eliminate the annual sanding, priming and painting required of old wooden frame windows while increasing the energy efficiency of your home. 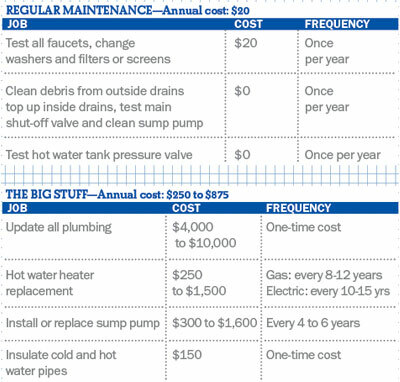 You’ll enjoy lower electricity bills in the summer, and lower gas bills in the winter. Also, consider replacing old doors, just make sure the door fits the frame snugly or air will seep out. The roof is an integral part of your home’s defence system. It’s also one of the most expensive components to replace, as my husband Mark and I found out. Swamped with his own contracts, my husband had originally planned to hire a company to re-shingle a small section of our roof. But the quotes he got were shocking: up to $7,000 to replace the plywood and re-shingle just 200 square feet. No joke. The good news is you can prolong the life of your roof, and reduce the number of cheques you write to Johnny-No-Thumbs Roofing Co., by implementing a few ongoing maintenance routines. First, pull out a ladder and climb on up there to visually inspect your roof. The best indication of a deteriorating roof is curled and separating shingles. Also examine the amount of grit and gravel that collects in your eaves and gutters. That grit is actually bits of asphalt rolling off the roof during high winds and rainstorms. If you find more than a quarter-inch of sediment, then it’s time to look at a new roof. Finally, look for waves or dips, which are early indicators of rot. If caught early enough, rot can be eliminated with the addition of more roof vents. Every year you should secure or replace any loose shingles, inspect the chimney and verify the chimney cap is securely fastened. You should also inspect your flashing seals. Flashing is the thin, continuous piece of metal (or other impervious material) that’s installed at every angle or roof joint to prevent water from seeping under the asphalt tiles. Sealant is used to strengthen this barrier and must be re-touched on a regular basis. Of course, if the thought of standing on a sloped surface 40-feet above the ground terrifies you, then you can always hire a handyman or roofer to do the annual inspection for you. Have you ever seen a house that leans to one side? Typically this is caused by a damaged foundation. And more often than not, problematic foundations are caused by homeowner neglect. Maintaining your foundation is an easy way to avoid very costly repairs. For example, you could spend $500 to repair the crack that develops where your driveway meets your home, or you could wait and pay $9,000 to excavate and waterproof a damaged foundation. The best way to stay on top of foundation issues is to visually inspect your home at the start of each season, explains Bryan Baeumler, a contractor and the host of HGTV’s House of Bryan. Look for signs of settling, such as small hairline cracks. Keep a special lookout for cracks that widen over time, cracks that follow your concrete block foundation in a step pattern, or cracks above windows. These may be an indication of a larger foundation problem. Also be diligent about snow and debris removal. Snow can melt and cause water damming, while debris can invite pests. Then look for the cause of the mold: where is the moisture coming from? Ignoring the problem and hoping it will just go away is not a great idea, as a friend of mind discovered when she neglected to address occasional sewer back-ups in her basement. To rectify the cause, she would have had to re-grade the soil outside her basement window and install a sump pump, at a cost of approximately $2,300. Instead, she left it. A year later those spots of mold grew into a disgusting carpet of spores over a foot high. She ending up paying for pre- and post-air quality tests, professional mold remediation, debris removal, re-grading and a sump pump, at a total cost of $22,000. Homeowners and unlicensed contractors are legally allowed to do their own electrical work, but you run a big risk if you don’t know what you’re doing, says HGTV’s Bryan Baeumler. “The worst I ever saw was a basement that was built for children and framed with steel studs.” The unlicensed contractors used an electrical wire without grommets, which enabled uninsulated wires to touch the studs. “The walls were actually live,” recalls Baeumler—if someone had touched the walls, they would have been electrocuted. As with heating and air conditioning, consider hiring professionals when it comes to electrical work. But even if professionals do the bulk of the electrical repairs around your home, there are still steps you can take to ensure things are in proper working order. For instance, you can make sure each light fixture is fitted with the proper bulb wattage. If you use a 150 watt bulb in a fixture that’s only designed for 100 watts, it can shorten the life of the bulb and the light fixture. You can also check your ground fault outlets by pushing the test/reset buttons. While you’re at it, check outdoor outlets and cords to make sure they aren’t damaged, and replace or repair frayed wires and plug heads. Finally, schedule annual alarm tests and routine battery replacements in every detector and replace every fire, carbon monoxide and radon detector every 10 years, when the alarms begin to degrade. Some do-it-yourselfers are comfortable tackling furnace or central air conditioning repairs, but most of us will want to call in the professionals. That means scheduling an annual inspection and cleaning of your furnace for the early fall. That way, you’re making sure that any potential problems with your furnace are caught well before the bitter cold season. The same diligence doesn’t have to apply to central A/C though, as long as you clean out leaves and debris before turning on the unit in the spring. Also, try to change your furnace filter regularly. Not doing so is like forcing your furnace to breathe through a straw. 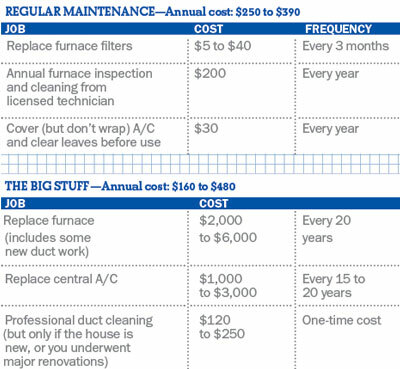 By replacing the filter every three months, you improve both your air quality and the efficiency of your furnace. You likely don’t have to bother having your ducts professionally cleaned though. The Canada Mortgage and Housing Corporation studied the impact of duct cleaning and found no difference pre- and post-cleaning. They did, however, recommend duct cleaning if you’ve just moved into a brand new home or just underwent major renovations. 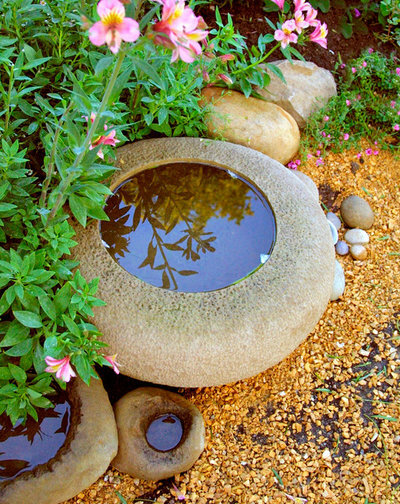 A well-appointed garden can add as much as 20% to the value of your house, but landscaping also has a hidden purpose that’s much more important: to drain water away from your foundation. To prevent water from seeping into your basement you should pay particular attention to the underside of the eaves (known as the soffits), the material that caps your gutters (known as the fascia), as well as downspouts and drains. Keep these clear of debris, such as leaves and twigs, and check for blockages. Expect to re-attach or fix these components on an annual basis. Remember: the easier it is for water to flow away from your home, the less likelihood of damage. Now, visually inspect the grade of your foundation and driveway. Examine the ground abutting your home, or, if you’re like me and dimensionally impaired, pour a glass of water on the ground close to your foundation walls. Watch what the water does: Does it roll away from the home? Does it pool in one area? Worse yet, does it roll towards the home and then sit, waiting to be absorbed? The minimum standard for grading is an inch for every foot, with at least eight feet of grade starting at your foundation wall. Any grade that doesn’t move water away from your home should be corrected. 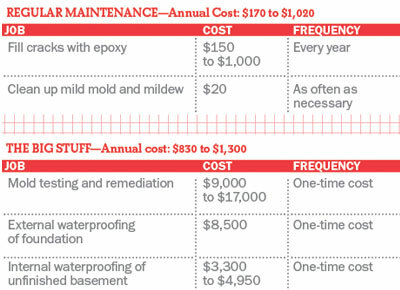 If not, you could end up paying for expensive waterproofing remediation—one of the most avoidable, yet costliest repairs to any home. Also consider removing boxed planters built against your foundation. 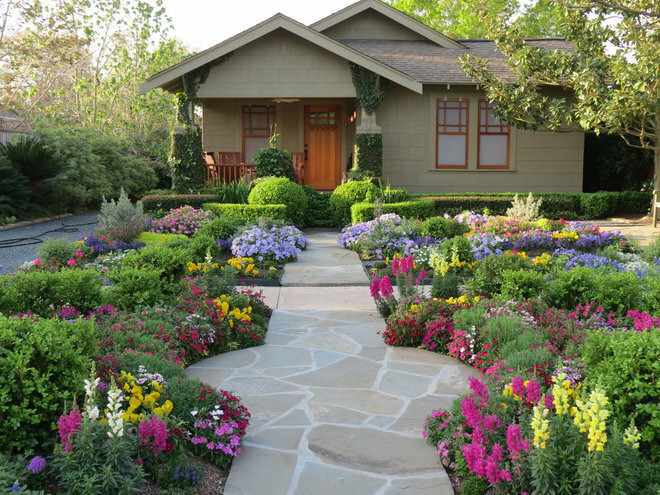 While these landscaping features can add a splash of colour and enhance curb appeal they can also cause problems, since water has nowhere else to go but into your foundation. Finally, pay attention to paths and driveways on your property. 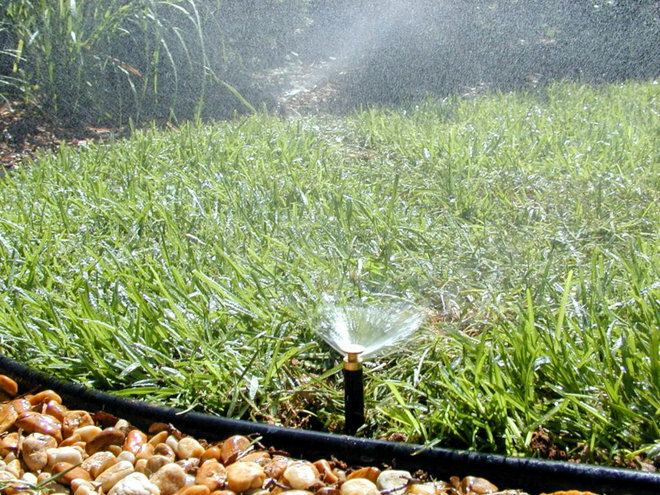 If they split they can allow water to seep into the earth, which can oversaturate your lawn, promote soil erosion and prevent the garden from keeping water away from your home. Small repairs to such hardscaping features can mean big savings later on. So what’s the total cost of transforming your home into an efficient, water-repelling system that never causes you any sleepless nights? 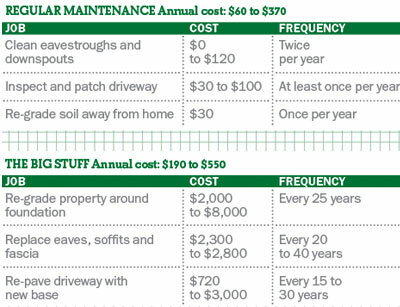 When I tallied up the annual cost of all of the regular maintenance, I found that you could expect to spend somewhere between $900 and $1,000 a year. If you hire professionals, you may spend upwards of $3,000 a year. But that doesn’t take into consideration the expense of major repairs, replacements and remediation. Those expenses tend to arise much less frequently, but they hit your wallet hard. 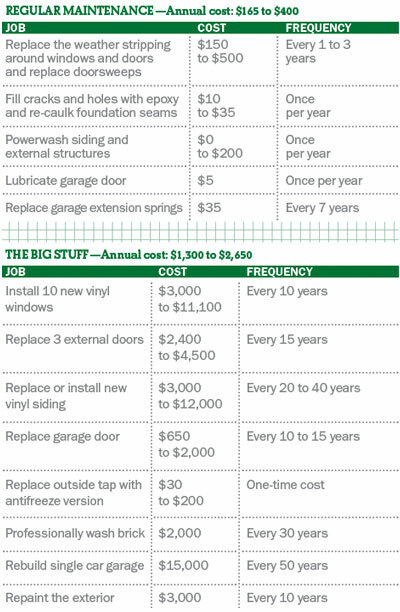 To make sure you’re prepared, you should set up a “big stuff” home maintenance account, to which you should contribute an extra $3,500 to $7,500 a year, depending on the size and age of your home. To double-check my figures, my husband Mark and I went back through our own reno and repair expenses, and we found that the numbers above are accurate. Of course, they don’t reflect the hours and hours of work that you do yourself (not the mention the help from friends and family). As many have said, renovations can be a lot like giving birth: They’re painful, they make you want to scream, and cause you to ask yourself why you’re bearing the brunt of all the work. And yet, you love the result and often end up repeating the whole thing. 9% neglected to mention the price of something. 5% admitted to secretly throwing out something of their partner’s. That little bit of nastiness might happen when you refuse to compromise on your own tastes, as was the case with 17% of respondents. While 63% said they did compromise, 6% threw up their hands and let their partner’s will prevail. That’s an unfortunate way to spend the following long years, staring at a design feature you abhor. 32% of respondents felt they took on more work than their partner — already a source of tension in real life, let alone in reno life. 3% to consider a breakup or divorce. 28% spend more time together at home. What did they learn from it? It goes back to communication and compromise. 30% said it was making a realistic budget (and of course sticking to it; note that secret purchase in the first point, above). Solar roof tiles are new invention that can help a lot in saving energy and lowering the electricity bills. The solar energy is what can provide so much for your home heat without too many costs. There are many alternative energy solutions that are more and more attractive lately but solar energy is maybe something that is endless and easiest one. Having a warm home and water is a big problem that needs a serious solution. With the great earth pollution and heating materials that do harm to the planet we are done. We should consider about other ways of bringing heat in our home instead of cutting trees and ruining the natural eco system. In the past this solar systems were so expensive and not everyone could afford it to buy and install it for their home. But, trough the years it became not so expensive and people can install it to their homes using it trough every season of the year. It is important to have a sunny day so the water of the system will be hotter. If not, there is always an alternative way to heat the water or the home interior. This solar photovoltaic tiles are very nice looking and are way better than the old panels on the roof of the houses. Those panels can go and retired because this is new innovative solution that works fabulous! The tiles are made of natural clay or slate slabs that have small solar panels inserted on the flat surface that should be exposed to the sun. Installing of those panels is very easy because of their shape and double function – tiles. They have so high energy yield although they are so small and flexible. There are also transparent solar tiles with highest aesthetical look. Those tiles are also very resistant to all weather conditions although are made of Plexiglas or PMMA. This material is even way better because it allows the sun come in trough the roof. They allow 90% of the natural light to come in your home.